Shimla is the place where you would find a rich green vegetarian cover, relaxed and peaceful climate, glorious snow-covered hills, cheerful local heritage, and a religious atmosphere. It is the natural Beauty Of India. When you’ll flee in this little and of course, the most amazing town of Himachal Pradesh, you’ll be enclosed to find comfort in the arms of its pleasant nature. Shimla is ideal for photographers as it provides enough moments to catch with their lenses. It’s not only about the stunning landscapes and hills but also about the culture of local inhabitants. Shimla, the snow-kissed land, provides people with some of the most eye-catching views of mountains, offers revelation to the state medium and local talents, takes people on a trip across the cultural richness of the land, and also the former structures from the British era. Apart from sightseeing, you can also indulge in different adventures like rock climbing, paragliding, skiing on snow, trekking spending tranquil days in the resorts situated at mountain-tops, and more. Mentioned below are top 20 best places to visit in Shimla which you might find amazing. The Shimla Ridge is popular for arranging various government fairs and functions. For all the major celebrations along with events, The Ridge of Shimla is the key venue. The most renowned festival, that is the Summer Festival, takes place here. Shimla Ridge is the center of all the societal activities. Some of the famous places of Shimla are Scandal point, Mall, Lakkar Bazaar, Jakhoo Hill, and many more are in close vicinity to the Ridge. Best time to visit Shimla Ridge – You can plan your visit to Shimla Ridge any time in the year but during the summer months, it is the best as the Summer Festival is held during these months. For photography points, Green Valley is really a prominent tourist place of Shimla. It is seen as the famous shooting point in various Bollywood films as the Green Valley brings forward limitless charm. Known for its upper-class charm, Green Valley has been listed in a number of travel books and articles. You can locate some rare animals like yaks at the Green Valley that are seen wandering and grazing here. People who come here can admire the rich green environments that are extraordinarily quaint. Best time to visit Green Valley – Green Valley is open throughout the year but the best time to visit this place is during the summer or post-monsoon when the thick forest has rich green environments. Perfect months are February to April and July to October. Popular for its serene surroundings, eye-catching views along with different amazing sites, Kufri is renowned as one of the perfect places to visit in Shimla. It is also prominent as the Switzerland of the East. The charm of the Kufri hill will surely attract all. In Shimla, it is perfect for adventure activities, like hiking and skiing that certainly must be tried at least once in a lifetime or when you visit Kufri. Snow-kissed mountains of Kufri make it the point for attempting your hand at skiing. Best time to visit Kufri – The perfect time to visit Kufri is during the months of winter. November to September months seems to be classic. If you are not adventurous then you can visit Kufri from April to June. Weather is pleasurable throughout the year. It is one of the most places to visit in Shimla. The highest point of Shimla, Jakhoo Hill is surrounded with the Alpine trees. There is a colorful Jakhoo Temple on the top of the hill along with the newly constructed Hanuman statue. It is known to be the admired escape for the visitors who experience peace and coolness; you just require being cautious of the monkeys who are always prepared to steal food items from visitors. The peak of Jakhoo Hill is about 200m higher than the Shimla Ridge. Here, Temple is devoted to the Hindu monkey god, that is, Lord Hanuman. Clearly, monkeys control the Jakhoo Hill. Best time to visit Jakhoo Hill – Perfect time to visit Jakhoo is during the months of November to March. Situated in the valley of Kotkhai in Shimla, Kiala Forest is one of the best places to visit in Shimla. Certainly, an attractive place to visit, it is charmed with the rich green vegetation along with enormous indigenous animals. Kiala forest is known to be a perfect place for all the wildlife admirers along with nature fanatics. Enormous visitors from a distinct location both far and near visit here to rejoice in the natural charm. Visitors and photographers can capture outstanding photos of the stunning landscapes along with animals as this forest possesses thick greenery and wildlife. Best time to visit – Perfect time to visit is during the months of March to October and also, it is open throughout the year. An ultimate destination, Chail is a place where you can set summer camps in a snow-kissed town. It was constructed for the motive of assisting people who want to flee from summer heats. Ultimately, Chail turned out to be one of the best destinations to visit in Shimla. Peace seekers and nature admirers can find this location perfect for fleeing from the hurly-burly of city life. Apart from having the pleasure of nature, you can also wander on the highest cricket ground in the world. Best time to visit Chail – If you want to witness snowfall, then December to March is the ideal time, otherwise you can visit between March to June. 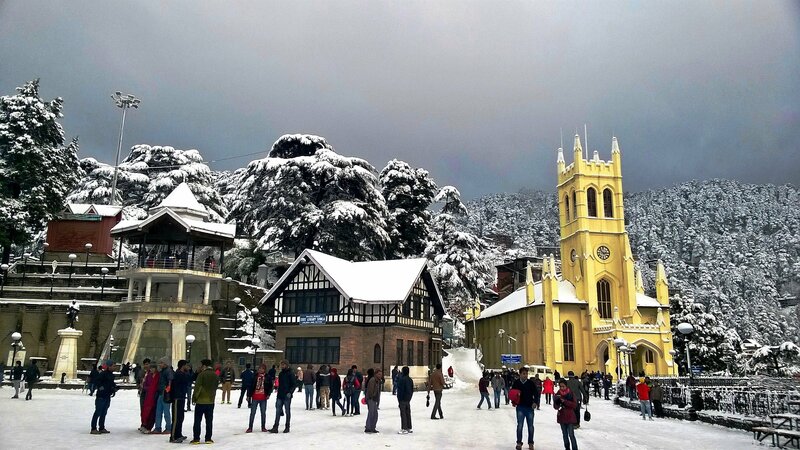 Among tourists, Christ Church is one of the famous places and is contemplated in the first 10 places to visit in Shimla. Constructed in the British era, Christ Church is a stunning architectural monument. If you want to get some taste of Christianity, then this is ideal for you. It was constructed in such a manner that it would exhibit hope, charity, patience, faith, humanity, and fortitude to make visitors knowledgeable of the Christian culture. Christ Church is worth giving a try as it is situated between spectacular landscapes and majestic locations. Best time to visit Christ Church – You can visit this Church anytime in the year when you visit Shimla. Annandale provides a delightful view of the Shimla with its all around as it is a very lovely spot. Here, the region is enclosed with stunning oak and deodar trees. It has been built as the playground of Shimla. Cricket, Polo and Golf are played here. Besides this, picnics are arranged here and moreover, you can also enjoy many funny and adventurous things. Best time to visit Annandale – You can visit Annandale anytime in the year. This ground offers all the facilities that may be required by the people. To get into history, Kuthar Fort is one of the best places to visit in Shimla. It is located in the enduring tranquility of the Himalayas. It is dispersed in the large region and also, there are a number of fresh-water springs. Kuthar Fort is covered by distinct lovely places like Gurkha Fort from Kunihar, Subathu, and Kasauli. Best time to visit Kuthar Fort – Kuthar Fort is open throughout the year. Surprisingly, Summer Hill is a charming spot in Shimla. The region is decorated by the calm beauty of mountains that offer it a good and spectacular atmosphere. If you want to take a pleasant walk between the serenity of Mother Nature, then this is a perfect location for you. Snow-kissed hills make it a lovely romantic gateway. Best time to visit Summer Hill – You can visit here anytime but, during winters, this place gives cool and humid weather. Shimla has come up with a new wax museum named as Johnnie’s Wax Museum. It has put 16 wax statues of distinct personalities beginning from Bollywood to Hollywood stars, and from Indian to International sports personalities. Some of the prominent statues incorporate Mahatma Gandhi, Lionel Messi, Daniel Radcliffe, Narendra Modi, and more. Many of these statues are built by those artists who have worked in the popular museum of Madame Tussauds, London. Best time to visit Johnnie’s Wax Museum– You can give a visit to Johnnie’s Wax Museum anytime in the year when you visit Shimla. Toy Trains are only in Himalayan regions and these give you some different sort of thrill and joy. While riding in Toy Train, you will be looking down the hill slopes, notice the calm nature partnered by the local flora and fauna, slopes crossing, and many more. Your trip to Shimla won’t be completed if you would miss a toy train ride. Best time to visit Toy Train – Toy Train can be enjoyed anytime in the year. But, during winters, the toy train tracks covered with snow, so it is also an ideal time to ride. The crystal clear water of the Chadwick Waterfall spurt deep down at a height of 86m approximately. What magnifies the charm of the destination are the covered hills along with the rich green trees of Deodar and Pine. You can visit this place after you have had a busy and tired travel schedule. This location will offer you enough ‘me’ time.Originally, this place was known by the name – ‘Chidku Jhaar’ where Jhaar means waterfall and in the local language, ‘Chidku’ stands for the bird. This is so because only a bird can reach at the top as the waterfall is at such a great height. ‘Chadwick Falls’ was the name given by the Britishers. Best time to visit Chadwick Waterfall– You can visit this place anytime in the year but it is suggested to go there in a group of people. It is devised by the giant Himalayas and the rich green forests that make it uniquely majestic. The rocky trails along with the dense forests, decorate the Shaily Peak. The charm of this place motivates everyone who comes to this location to capture the beauty and pictures. Best time to visit Shaily Peak– You can visit Shaily Peak anytime in the year. The perfect time to visit this place is morning if you want to trek. The Shaily Peak appears magnificently breathtaking during the sunrise and the sunset. No need to take your lunch if you think to travel out on a trek. This temple is very famous tourist place that is located at a deliberately planned location. Kali Bari Temple, constructed in 1845, is devoted to Goddess Kali who is also renowned as Shyamala. Kali Bari Temple is known to be an extraordinarily religious place of India. It is said that anyone who visits Shimla must not miss this place. Best time to visit Kali Bari Temple– You can visit this place anytime throughout the year. In any hill towns, Mall Roads are usually an extended area of any road bordered with various small shops, shops, and branded showrooms. For enjoying a range of eateries, bank ATMs, cafes, food stalls, shopping choices, and money exchange portals to meet necessary prerequisites, Mall road in Shimla is one of the lively roads. If you are a small street person with good bargaining skills, then you might return with an extra bag as the items exhibited on Mall Road are a bit expensive. Wandering and walking is some other way of having the fun of the busy lanes of Mall Road in Shimla. Best time to visit Mall Road–It is also the main attraction of Shimla so you can visit here when you visit Shimla, but it is suggested to visit this place during the winter months as you’ll experience snowfall at that time. Historically important and the most beautiful building of Shimla, Viceregal Lodge is structurally rich and books for a great half-day tour. In this Lodge, the Viceroy has taken various necessary decisions as he was the British Raj leader between 1888 until 1946. This place is also prominent as the President’s House or the Rashtrapati Nilayam. Here, the reference is on the time between independence to the mid-1960 when the symbol was used by the Presidents of India as their summers flee. Best time to visit Viceregal Lodge– You can visit this place anytime throughout the year and you have to pay Rs. 20 as the entry fee. If you are searching for a place in Shimla that would offer you peace of mind, cycling or walking across the Shimla, then water catchment wildlife sanctuary would be an appropriate option for you. This place is frequently visited by tourists; the rich green forest doesn’t permit many people to assemble at the same location together. So, peace resides in the air and you can cycle or walk across quietly without anyone to disturb. The quiet forest provides people a feel of a lifetime as they get open to the intertwining cedar, oak, deodar, fir, and spruce trees. Apart from this, you would observe more than 300 species of animals and plants enduring in the forest while your cycle riding trip. Water Catchment Wildlife Sanctuary is often known as the jungle paradise or the bliss of Mother Nature because of the dispersed expansion of rare flora and fauna. If you are a nature admirer, then this is an ideal place for you. Best time to visit – This wildlife sanctuary can be visited anytime throughout the year. By the photographers and bird watchers, Himalayan Bird Park is one of the most visited tourist places of Shimla. While Shimla is a delighted city, its charm is increased by the huge variety of wildlife flourishing in the forests and hilly slopes. It is such sort of place where you can notice a huge variety of birds which you haven’t observed yet. This park also supports calm and soothing trees, flora and fauna. Some of the bird species include peacocks, Himalayan monals, pheasants, and more. These species are the major reason for impressing visitors in this park.It is a quiet place where you can find tranquility. Best time to visit Himalayan bird park– Nature lovers and photographers would love to go anytime at this place. Prominent for vivid flora and wildlife sanctuary, Manjathal Sanctuary is a heaven for all the wildlife lovers. There are no hotels or resorts built here in this area so that the natural charm of the place can be maintained. It is a perfect place for kids as they can do camping here. Manjathal impresses enormous nature admirers throughout the nation and is a residence to various endangered species. One of them is the Goral that is a different sort of mountain goat along with the Cheer Pheasant that is accepted to be endangered by the International Union of Conservation of Nature. Best time to visit Manjathal Sanctuary– During winters, you can have a pleasant time here. Shimla is capsuled with opportunities for all everyone and also adventure lovers who are never pleased with the joy they get from normal life. So, what you need to do is to pack your bags and set out for Shimla on your next holidays.